Dipropylene Glycol (and) Polysilicone-29. 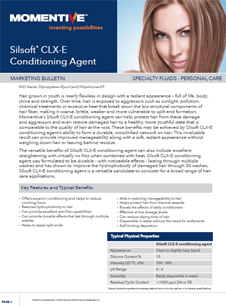 Silsoft* CLX-E emulsion by Momentive Performance Materials acts a conditioning agent. 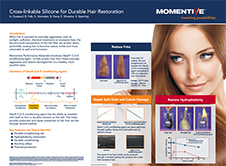 It is a cross-linkable silicone that is very effective at low dosage levels to aid in restoring manageability to hair, help protect hair from thermal assaults and to boost the effects of daily conditioners. It also helps to reduce drying time of hair, reduce combing force and repair split ends. 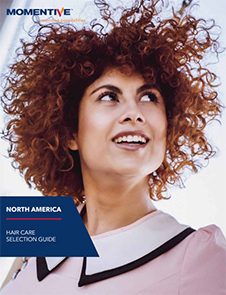 Silsoft* CLX-E emulsion is applicable for various hair care formulations such as leave-on & rinse-off conditioners, shampoos, serums, treatment ampoules, pre-treatment for hair dying and thermal hair straightening/curling products. It can also be used in color protection products, shine spray, ethnic hair care, body wash and liquid hand soap.